Today is the end of 2009 and I can’t believe how fast it went by. A lot of things, good and bad, happened in 2009. And there is really no need to mention any of them since they have already happened. Now I am looking forward to what 2010 will bring us. I am really not a “resolutions” type of person. When I was younger, I felt bad when I couldn’t live up to the resolution that I would make on New Year’s Eve — the whole “failure” thing. But I am one who tries to find things to make myself better than the previous year. While I was surfing the new at work (don’t tell anyone), I found this article and I liked what it said. So I am passing it along for others to read (to read the whole article, click on the link below). 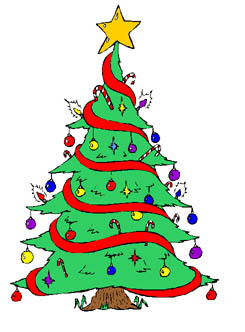 New Year’s resolutions top many to-do lists each holiday season. The new year is a beginning so new goals and resolutions, new plans, new dreams and new directions fuel your thoughts. Do something just for you every single day. Give yourself credit and a pat on the back when you deserve it. Strive to learn something new every single day. Make professional contacts and network. Practice professional courage by stepping out of your comfort zone. Read voraciously to continue to learn and grow. Take yourself a little less seriously. So I am not sure if it is because I am older (and wiser) that all of these make sense to me now. For 2010, I will try to remember these goals, resolutions, plans or directions. But my main goals for 2010 are to be healthy, happy and surround myself with family and friends who will help me on whatever journey I take. Happy New Year to all that read my blog! I have had so much fun blogging about what pops into my head! It has almost been one year since I got my 160GB iPod. I like how iTunes keeps track of the number of times you play a song. Those songs are not necessarily my favorite songs, but the most played songs. As you can tell from some of my postings, I love listening to my iPod and all different music I have on it. I am looking forward to finding new music to listen to, as well as listening to all of my favorites. Every year I try to catch the Kennedy Center Honors show. It was on tonight and I remembered to record it since I wouldn’t have been home when it started. And I am glad I did! This year’s recipients were: Mel Brooks, Dave Brubeck, Grace Bumbry, Robert De Niro, and Bruce Springsteen. I was really looking forward to the tribute to Bruce Springsteen. John Mellencamp, Melissa Etheridge, Ben Harper, Jennifer Nettles, Eddie Vedder, and Sting all did a great job singing Sprinsteen’s songs. It was pretty cool watching the President and First Lady jamming to Springsteen songs. But it was American jazz pianist Dave Brubeck tribute that I enjoyed the most! One of Brubeck’s songs “Take Five” (1961) is on of my all-time favorite songs! 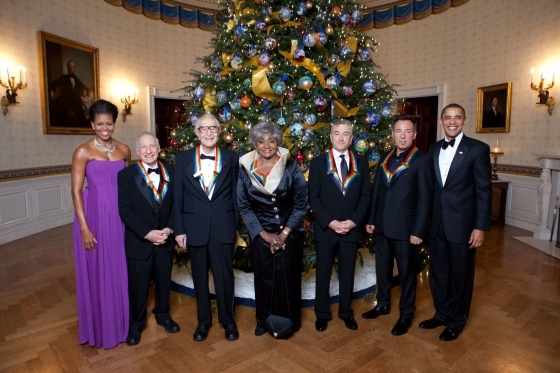 (from Kennedy Center Honors website). Then Dave Brubeck’s four sons played on stage and played with the All-Star Jazz Quintet. Yes, it brought a tear to my eye. Then all of the musicans played “Happy Birthday” for Brubeck — it happened to be his 89th birthday. When the tribute for Brubeck was over, I went to my laptop to find Dave Brubeck songs. I am looking forward to listening to more of Dave Brubeck songs. I can not believe that 2009 is almost over! As in years past, I am doing my part in passing along JibJab‘s Never a Year Like ’09. Octomom. Balloon Boy. Tiger Woods. If there’s one thing for sure in this world, it’s that as long as people are acting reckless, insane and just plain stupid (i.e. like people), there will always be plenty of material available for JibJab’s annual “Year in Review” videos! Also, check it out and comment at http://sendables.jibjab.com/originals… ! It has been an interesting 2009… I am looking forward to 2010 and all it has in store for us! 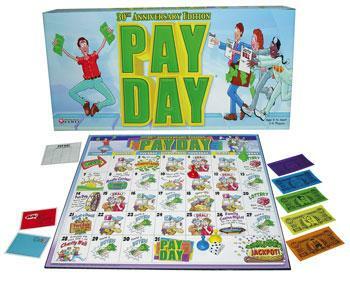 Do you remember the game… PAYDAY? I was thinking of board games that I used to play when I was a kid the other day. One of them one of them was Payday. The classic game of making and spending money! It all takes place on a calendar-style playing board where something happens every day, but PayDay isn’t until the end of the month. You’ll receive mail (including bills), make deals or even win the lottery! Unfortunately, you may spend more than you earn and have to to get a loan just to pay your bills. I used to play this game with my brother for hours. I don’t think I ever read the directions on how to play the game, we just played it. I think we used our own rules on how to play the game. I just read the rules to Payday and I didn’t understand it. So there is no way I would have understood it when I was a kid! I Googled Payday to learn more about the game, I was shocked to learn that there is a 30th Anniversary Edition — holy cow, that made me feel really old!! I made an enchiladas dinner with all of the sides and while I was eating it, I was thinking what different combination of the food would make a perfect bite. Here is my perfect bite of this dinner… some enchiladas, with a little refried beans and spanish rice. I am sure there are many, many more “perfect bites” that I have had. But these are a few I can think of right now.